I enjoy seeing patrons who attend music concerts week after week, season after season. The Sunday Concerts have cultivated a community for music enthusiasts in DC to gather and share an afternoon together. I often witness audience members leaving concerts more invigorated than they were coming into the concert. I’m a business analyst at the Carlyle Group where I’ve worked for five years. In the fall, I will be joining the MBA program at the Wharton School in Philadelphia. The Music Room holds a special place in my heart. I’ve spent many moments unintentionally holding my breath in the Music Room, captive to the music vibrating off the dark wood paneling. 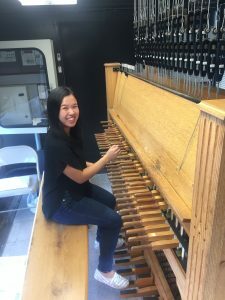 I play a bell tower instrument called the carillon and have performed concerts in 10 states since 2013 as a member of the Guild of Carillonneurs in North America. Come hear me play this summer at the Netherlands Carillon in Arlington on June 30 and the McDonogh School on July 6. While I’ve enjoyed exploring other nearby venues for Sunday Concerts, I am excited to be back in the Music Room after the renovation is completed this year! This entry was posted in Experiment Station and tagged Carlyle Group, Guild of Carillonneurs in North America, Music Room, Phillips Music Volunteers, Sunday Concerts. Bookmark the permalink. I would do this with you?